Our annual dinner and auction fundraiser, Beans ‘n’ Jeans, is Saturday, April 21st at the SEL Event Center. 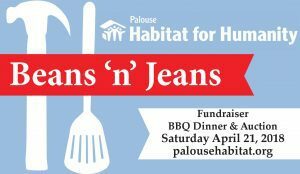 Call the Habitat office at 208-883-8502, click here or order online, or email habitat@palousehabitat.org to reserve your tickets now! Tickets are $40 each, or $400 for a table. Auction items are welcome through the end of March for the live and silent auctions, and sponsors are still needed to cover the costs of the event. With Habitat for Humanity, it’s the community that builds the home. Which means we have to raise all of the $120,000 that it costs us to build a habitat home locally. These funds pay for land, building materials, licensed contractors for plumbing and electrical work, and skilled supervision for the volunteers who do all the amazing work to build the home. Last year we raised $87,000! Help do it again!